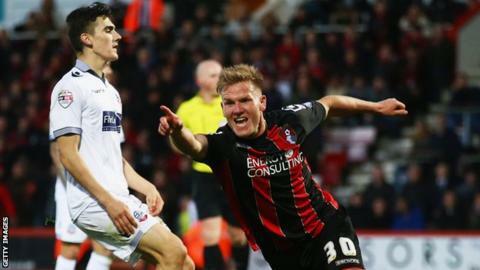 Matt Ritchie hopes to build on promotion success with Bournemouth by helping Scotland qualify for Euro 2016. "Every player dreams of playing at the top level and, if I could achieve that with Scotland, that would be unbelievable," he told BBC Scotland. The winger, who won his first caps in March, scored in a 3-0 win over Bolton Wanderers on Monday that secured the Cherries a place in the Premier League. "It has been an amazing year and hopefully it can continue," he said. "From what I saw when I was up in Scotland with the lads, it was a great camp and it was great to be a part of it and hopefully I can be a part of it again. "It is a massive game coming up against Ireland, but I think, if we win that, we are in a great position to qualify for the Euros." Ritchie was drafted into Gordon Strachan's squad to face Northern Ireland and Gibraltar despite admitting he had never been to Scotland, his father's homeland. "It was a bit of a surprise, but I was honoured when I got the call and to feature in both games was amazing," said the 25-year-old. "It's been great. The confidence you get from that is massive." "We need Watford to slip up on Saturday, but we'll be going to Charlton, making sure we prepare properly and hopefully we can do our bit and rely on Sheffield Wednesday at Watford," said Ritchie. "We made a good start to the season and a lot of people probably wrote us off and thought we'd fall away, but we made it our aim to stay focused and we managed to achieve the dream." Ritchie has scored 13 goals this season - equal best by a midfielder in the Championship - and has the most assists at 17, but he stresses that it is team-work and manager Eddie Howe's "attention to detail" that has been key to Bournemouth's success. "It is a dream come true to play in the Premier League," said the winger who joined Bournemouth from Swindon Town in 2013. "I had a sniff of it at Portsmouth, but I didn't really earn it - I was chucked in the deep end for a couple of matches when Portsmouth were in trouble." With a 12,000 capacity, Bournemouth will have the smallest stadium in Premier League history and they have come a long way since going into administration in 2008. "I only live half an hour down the road, so when it was all happening, I was aware of it," said Ritchie, praising chairman Jeff Mostyn and owner Maxim Demin. "The transformation has been unbelievable."